Lexus has confirmed a new turbocharged 2.0 liter engine for its upcoming small crossover. 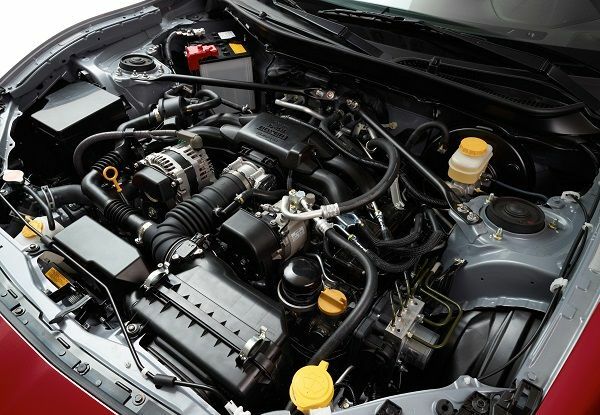 That engine could make the next generation Scion FR-S the perfect sports coupe and invigorate tC sales. Toyota needs to do something bold if Scion is to survive. Having driven the 2013 Scion FR-S sports coupe on a couple of occasions, this author can confirm that the car is nearly perfect in stick shift form. The only thing it lacks is more torque, meaning the ability to accelerate strongly. The boxer four cylinder engine that it has is simply not powerful enough to be called perfect. The real problem is the torque. 151 lb-ft is simply too little twist, and it comes too late in the rev band. In automatic form the car is a dog. It’s actually embarrassing. Its 200 horsepower would be fine if the car had a nice torquey turbocharged engine with the torque curve designed to be flat and found at low RPS (say 2000 to 2500). This car needs a new engine to join the all-star list. Unlike every other auto writer, I have mostly ignored the Scion FR-S and the Subaru BR-Z. Having driven them, I had no personal interest due to the lack of power. The cars also sell in tiny numbers, not even beating electric cars for sales, so what’s all the fuss? Now that Lexus has recently introduced a new 2.0 liter turbo engine to drive its new LF-NX crossover things might be changing at Toyota in general (parent of Scion and Lexus). That move got me wondering if Toyota is waking up to the fact that it, like Honda, pretty much missed the boat. All the other manufacturers are now gaming the system by using turbos to trick the EPA test cycle for an extra MPG or two, so why not join the party? I am no fan of turbos as readers of my work know, but I like them a lot more than underpowered engines. Before any Scion FR-S fans blow a cerebral artery, yes, I know that the Lexus turbo four will very likely not be a boxer (horizontally opposed) style engine. Instead, it will most likely be an in-line 4 with counter-rotating balance shafts. So I know it won’t drop right into the existing FS-S engine bay. Or engine slot more accurately. That is why my story line mentions the next design iteration of the Scion. As a former owner of a ’79 Supra, I know very well that Toyota as a brand has always bumped up the size of its cars and the power of its engines during model redesigns. Perhaps Toyota will have a chat with Subaru and figure out how to add 50 ft-lbs of torque to the cars they designed to be sporty, but are in fact slower than Legacy and Camry sedans. In the Scion tC, which sells equally well compared to the FR-S, or just as terribly, depending upon your view point, the new Lexus 2.0 turbo would in fact slot right in. Were Scion to make the tC a little more visually interesting (like the Veloster), and add this new engine, it might sell more cars. In a twist of irony, one reason the tC might continue to be only a non-turbo car is that Toyota might like to keep the FR-S at the top of the list over at Scion. Check out the Scion website if you don’t believe me. The FR-S is literally at the top of the list despite being third in sales for the brand. Toyota has had big changes in attitude at the top lately. The company wants more exciting products and even considered a mash-up with BMW to create a sports car. Toyota needs BMW like a fish needs a bicycle. What Toyota really needs is more mainstream excitement. Dropping a couple turbochargers into the Scion line could possibly save that sub-brand from extinction. Tc is not a race car, it does not need a turbo! It has a great style and body, different from same old civic design. A little bump over the hp (while keeping mpg same or improving it) could be nice, say 200hp. Tc monogram features should be the base Tc version for 2015. All Tc need is some upgrades on the inside and thats it.